Troutrageous! Fly Fishing & Tenkara Blog: Tenkara Tuesday: Oh (N)Oni! I've been suffering a little bit of fishing withdrawal. It usually happens the weeks after I get away to fish. Wanderlust sets in and I tend to go into writing slumps. 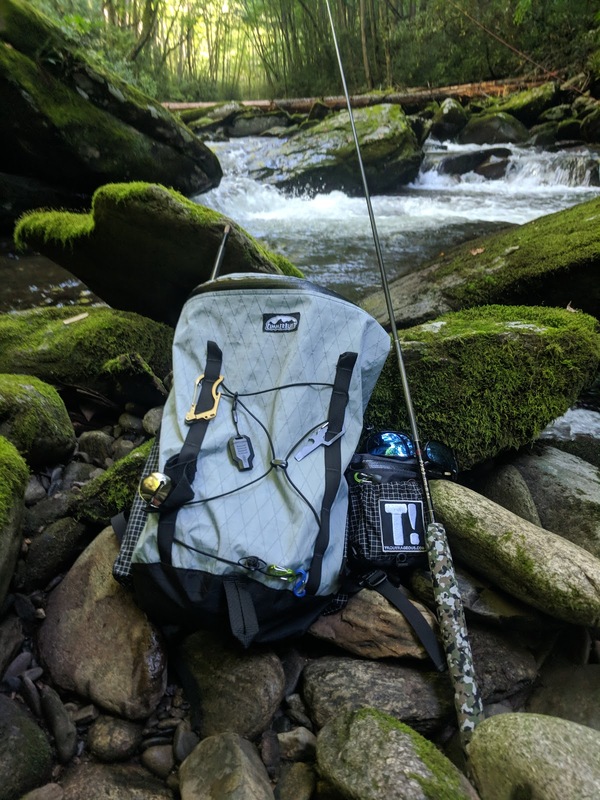 In an effort to try and kick that before it gets really bad, figured I'd share a few gear updates/observations that recently impacted my tenkara fishing... perhaps they'll come in handy for you as well (if applicable). 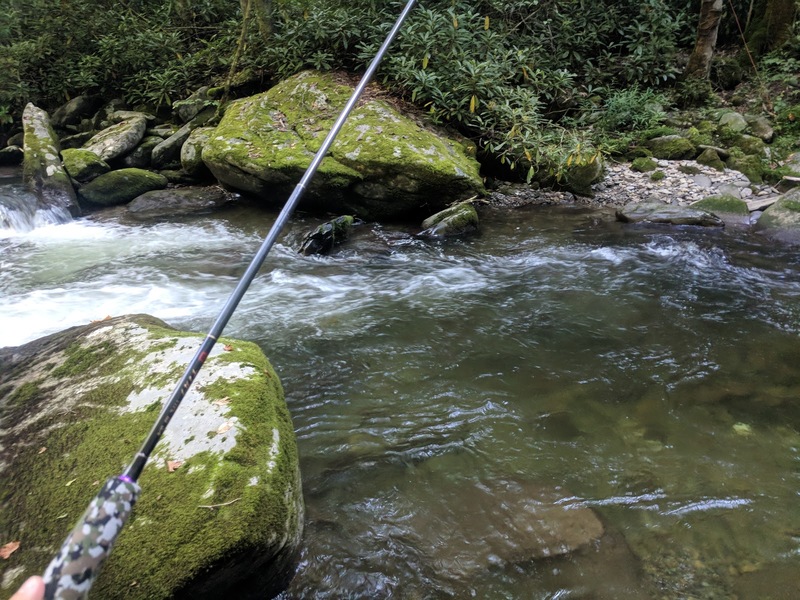 First off, I didn't mention in my recent "Mountain Medicine" post that I busted my Oni Type III tenkara rod when I was in North Carolina... yeah, that sucked. My heart immediately sank in my chest. It's never an enjoyable experience breaking a rod, but when it's due to your own carelessness...ugh. Well... that just compounds the shame. Fortunately, my loss is potentially your gain, as I would like to pass along a great experience with the Team Oni USA shop, the online retailer that now sells Oni rods, as well as services parts. After a few dejected emails on Labor Day, John Vetterli had my replacement section in my hands in two days. That's some good, speedy service if you ask me. There's actually a lot of great customer service from our larger community of tenkara vendors, and I'm glad to see this new resource is no exception. So fear not with your Oni rods, John has you covered - for a fee of course. Yeah, these got wet for a few days as well. While this isn't a long-term review (two days of fishing), I'm happy to report that the boots I've been writing about pretty much perform as advertised. Extremely lightweight (hardly noticeable on the hikes in and out) and fairly grippy on those slick Appalachian rocks. 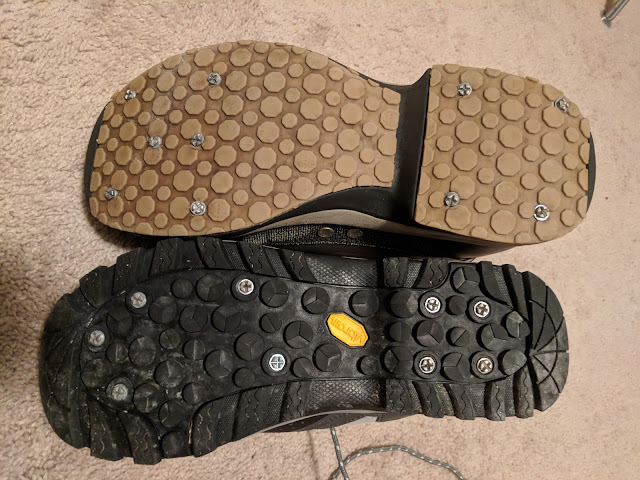 I did end up adding screw in studs to aid a bit with the traction, but I've always done that on trips to the Blue Ridge. The one thing that did take me a smidge to get used to is that the rubber soles are more of a lug style than what I'm used to, so when you hop around from rock to rock, you just need to be slightly more deliberate with foot placement to "feel" what's underfoot. That being said, the extra rubber indentations added a better level of grab and leverage when pushing off of rocks that I enjoyed. So while the primary review is good, we'll see how they handle over the long term before I truly pass judgment. I'm not certain if I've ever written about water filtration here before, but the more I use it, the more I absolutely love my Sawyer Squeeze filtration system. 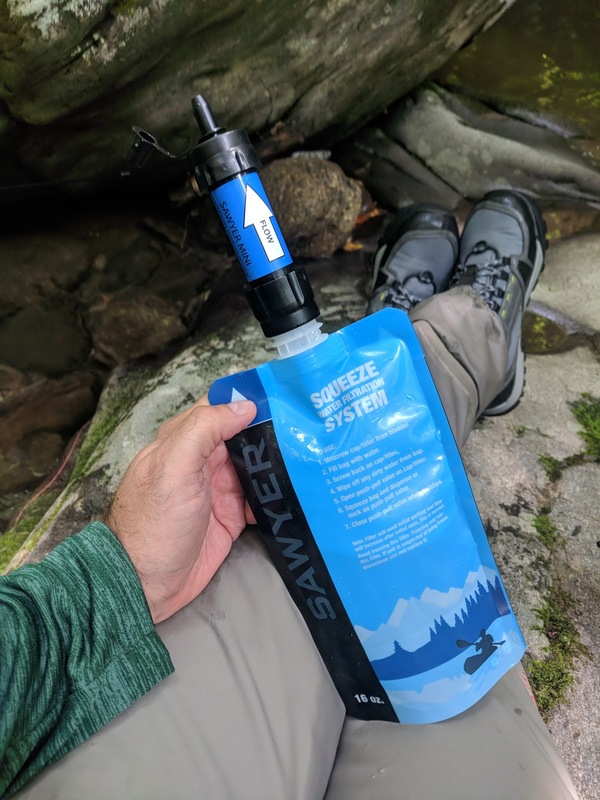 I've used other solutions in the past, such as a Lifestraw as well as water bottles that incorporated internal filters, but I just don't think there's a better, (or easier to use), system for the wading angler. Particularly one that has access to abundant cold water all around them. In my opinion, it's the perfect size to quickly fill, grab a drink to keep you hydrated on a hot day, and then stow away small in your pack to the point where it's unnoticeable. It also saves you the space of not needing to bring a dedicated water bottle. I've heard some people have had some issues with the plastic water pouch/bag leaking over time, but I haven't had that experience yet, so it's all good by me. Are there any pieces of gear you that you find make your afternoon in the mountains more enjoyable? I would love to gather additional suggestions in the comments, as I'm always personally keen on learning ways to refine both the gear I use and wear, as well as what I keep inside my fishing daypack. Mike, I've had an interest in that Sawyer bottle for some time. It takes the bad stuff out of the stream water and makes it safe to drink, am I correct? Are there replacement filters, and how much water does it hold? Yes! It does take all the bad stuff out. I don't think there are necessarily replacement filters, you can backwash the one included to keep it clean. The pouch I have is 16oz, but they also come in 32oz. I ended up going with Redington for the new wading boots, but those Orvis boots were a close second on the list. I have not gotten my first tenkara rod yet, but I swear it's on the (Christmas) list. Hey Mike, great post as always. I love how your posts are diverse--not just one topic. That makes for a more interesting read. I also recently broke my Oni Type III and just got the replacement parts for it. It's great to have it back in action as it's one of my top 5 favorite rods. 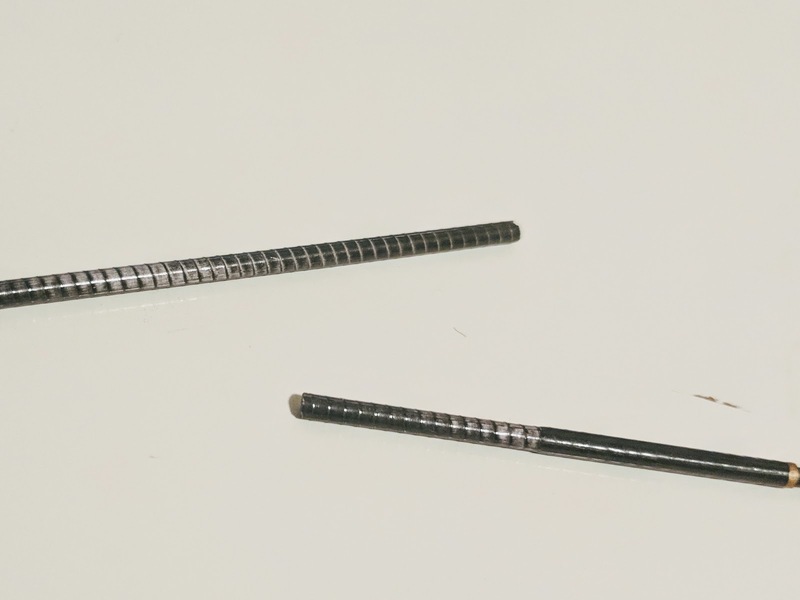 When a beloved piece of gear in one's arsenal befalls tragedy, it's like having a wounded limb. Since you asked about "comfort gear", I sometimes take a small cooking kit to make coffee streamside. It's just a Snowpeak 600 titanium mug with an alcohol stove. It's compact and UL so it doesn't take up a lot of space nor impact my carry weight. I'm normally lazy and just carry a thermos, but sometimes it's nice to take a break from fishing, sit on the banks and have some quiet time with a freshly made cup of java. Great call on the stove & mug Jason! I'm not a coffee guy (I know, I know), but I do have a small Soto stove and MSR trail mini cook pot that I'll often throw in my pack in the fall or winter. I'll use it to heat up some warm streamside lunch - usually instant ramen or soup. Personally, I would have blamed the broken Tenkara rod on Sasquatch like i did. Makes you look good when you battle Sasquatch over a fishing rod rather than just saying "I broke it". Got to use a little literary license now and then. Great to hear Bill, happy you liked the recommendations.